Robert Wyatt has very few rivals for the title of most influential percussionist in British underground music (among many other things), but he hasn’t played drum kit in over forty years, after losing the use of his legs in an accident. The release of an album on which he does just that (among many other things) is something of a significant event for many listeners, then, and there are other reasons for the great interest (and appreciation) with which ’68 has been greeted. It offers a snapshot of his musical development at a crucial moment in the growth of the more creatively rigorous side of British psychedelic music, just as he was about to produce the work that was arguably his most influential. These recordings were made in New York and Los Angeles, after the conclusion of a U.S. tour supporting The Jimi Hendrix Experience by (and the dissolution of) the incarnation of Soft Machine documented on their eponymous debut album. Wyatt stayed in the States to produce some solo demos, although the bulk of the material released on this record found its way into the next two full length releases from the reformed Soft Machine, which is an important aspect of ’68’s pronounced historical interest. This was probably the most influential period in that band’s varied history, an era in which they contributed a lot to the definitive sound of jazz rock or fusion, and particularly to the form it took on the eastern side of the pond; the more song focussed music they were also releasing was largely down to Wyatt, so to hear this material at the earliest stage of its evolution, some of it quite possibly composed extemporaneously in the process of making these demos, offers the kind of insight that rock critics fantasize about. This explains some somewhat over-excited references to this album as a Holy Grail; I mean, it’s exciting, it’s historically fascinating, and it’s also musically superb (in case you were wondering, and I promise I’ll return to that theme shortly), but it won’t heal your ailments, or offer you a shortcut to spiritual perfection. Wyatt’s importance as a musician extends beyond his relatively short time with Soft Machine; he was a founding member, but left in 1971 after the release of Fourth, going on to an extremely distinguished and influential ongoing career as a recording artist in his own right. This glimpse into his creative prehistory is also very valuable in the light of that later career, although I will leave an assessment of its historical significance to writers of a more scholarly disposition. Suffice it to say, that ’68 shows us a musician of already considerable skill and creative vision, at a time when the work for which he is best known was gestating. Clearly the fact that these are demos, recorded by one person overdubbing, influences the character of the sound. I was already aware that Wyatt is an accomplished keyboard player, and a gifted singer, but I didn’t realise he already knew his way around a bass guitar quite as well as this in 1968; ‘Chelsa’ features a free-flowing and expressive bassline that echoes the meandering and gestural contours of the vocal melody, and suggests someone entirely at home with the instrument. This range of skills is sufficient to ensure that the music feels consistently fleshed-out, and there’s nothing schematic or audibly provisional about the arrangements on the album; but the textures are much sparser and more open than those you’d expect from a band, and certainly more so than the music that was likely to be commercially released in the late 1960s. ‘Rivmic Melodies’, much of which was re-used for side A of Soft Machine’s Volume Two, consists of drums, piano and vocals only, but ‘Slow Walkin’ Talk’ (written by bassist Hugh Hopper’s older brother Brian) features a sterling, hard grooving bass part performed by Jimi Hendrix; in ‘Moon In June’ (another important piece of Soft Machine pre-history) bass is mainly handled by the organ, which is overdubbed with piano, acoustic and electric, all three instruments receiving a vigorous seeing-to of the sort normally facilitated by mutually reinforcing jam-session ecstasy. The latter part of this last track is among the more exciting and melodically engaging jazz-rock improvisations I can recall hearing; that it was the work of one musician, and one that was supposed at the time to be some sort of pop artist, is decidedly impressive. Aside from ‘Slow Walkin’ Talk’ the vocal elements of the music have a very free, loose feel, although they are clearly written and performed with a good deal of precision; both lyrics and melodies have a free-associative feel to them, as though Wyatt were singing the first thing that came into his head (e.g. ‘eiderdown/ you’da down too/ if you could’); this extends to the formal structure of the compositions, which feels fluid and ad hoc, even when it’s pretty much straightforwardly strophic. For all the excellent keyboard and bass guitar work on these recordings, it is as a vocalist and a drummer that Wyatt really lays it down, and there’s a sense that, even when there’s a lot else going on, the essence of the music is always a duet between the voice and percussion. The two sounds are very well matched sonically, with the bright, crisp drums complementing Wyatt’s mellifluous tenor perfectly, but more importantly, the feel and phrasing share that playful sense of fluidity and liberty that is so characteristic of his musicality. When Wyatt played the drums, he really did sing through his instrument, something to which many players aspire but which few attain, and it’s in the moments when it does come right down to percussion and voice that a real sense of creative clarity rings out like a chime. Wyatt’s absurdist humour is front and center, and never more so than in his half spoken paean to the ‘British alphabet’ in the first half of ‘Rivmic Melodies’; for me, daft as it is, this section of the music is the creative heart of the album, the key passage in which we can hear Wyatt simply playing, in all senses of the word. Sadly, aside from the ascent and descent of the alphabet which bookend it, this passage didn’t make it onto Soft Machine’s Volume Two, although a few amusing phrases were plundered for ‘Pataphysical Introduction Part 2’; much of the material remained intact, however, and it’s certainly a treat to hear it in this earlier, already fully realised, but distinctly different form. There are more obvious contrasts between the two versions of ‘Moon In June’, particularly lyrically. The first part of the song as heard on ’68 was completely supplanted for the Third sessions by material from the previously released Soft Machine songs ‘That’s How Much I Need You Now’ and ‘You Don’t Remember’; the second part, which is largely the same on Third as here, betray an intent to moderate both the song’s absurdities (‘before the penguin flies’ becomes ‘before this feeling dies’) and its darkness (‘everybody dies’ becomes ‘distance tells us lies’). It makes sense that a demo recorded alone would be a more idiosyncratic beast than a recording that has been made collaboratively, but there’s a marked shift in emphasis between what Wyatt got up to on his own, presumably pretty burnt out after a tour in support of one of the most legendarily psychedelic acts in history, and the version he managed (barely) to persuade his bandmates to include on Third. That later version of ‘Moon In June’ was Soft Machine’s last vocal ‘pop song’, and Wyatt had to construct it himself in the same way as the demo, as the others were pretty much uninterested in that sort of music making by that time. He did a good job of it then, but it’s one thing to do that with the support of a budget and a producer and all the rest of it; two years earlier he did just as good a job of it making a presumably self-funded demo, and whatever the specific creative reasons for his eventual departure, it seems to me that Soft Machine needed him a lot more than he needed them! 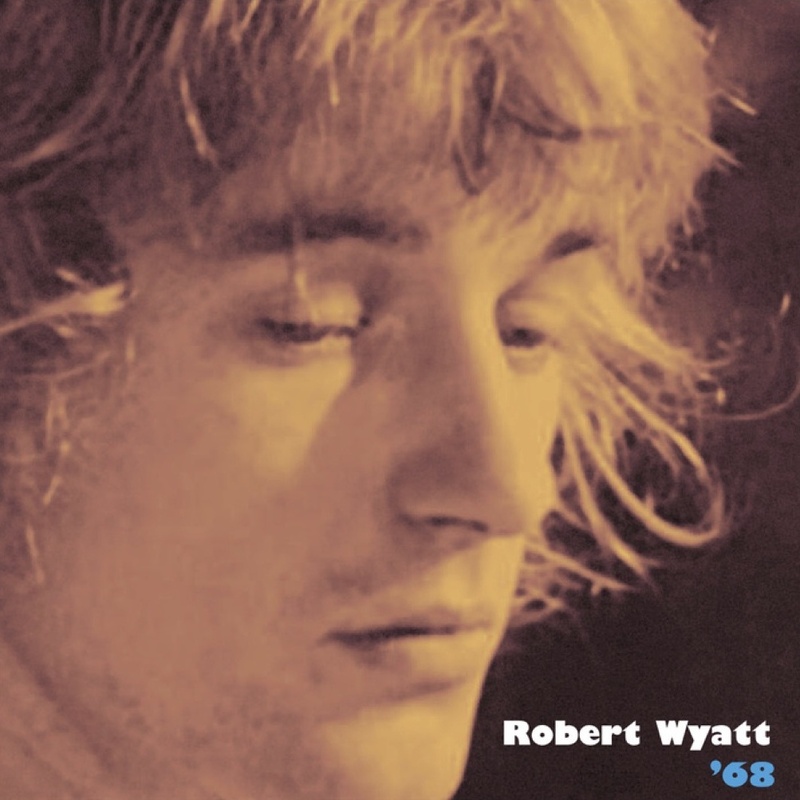 Much of ’68 is flat out beautiful, such as the Spanish section of ‘Rivmic Melodies’, or most of ‘Moon In June’, or, well, to be honest, almost every bit where Wyatt isn’t just arsing around; there is an absolutely indefatigable creativity at work here, continually transforming the music through long, mutating, formally indistinct sections, where idea follows idea with such rapidity and so little ceremony that it almost becomes normal, and it’s only when the music stops that you realise you’ve just heard enough ‘content’ to fill a dozen ordinary LPs. His way with melody is so deft as to throw his subsequent creative integrity into very sharp relief, by which I mean that if Wyatt had chosen to devote his life to making commercial pop music he would clearly have done extremely well for himself. The hit single he had in 1974 was no random happenstance; a voice this good, and tunes as good as those to be found on ’68 could have been parlayed into almost any kind of a career (at least with the kind of head-start that comes from supporting the Experience around the US in 1968), and I’m profoundly grateful Wyatt chose to follow his muse. This music comes from a place, not necessarily of courage, but certainly of fearlessness, of a creative willingness to go anywhere and just see what happens, and as such, distinctions between the earnestly avant-garde and the generously accessible are more or less meaningless; but both of those positions are co-ordinates on the continuum occupied by this music. Atonality, poly-rhythm, intense modal blowing, whimsical psychedelic harmony, deep earthy groove and heart-melting melody co-exist here without the slightest sense of contrivance or pretension. All this and more is easily encompassed by the musical genius of the young Robert Wyatt; I like to kid myself I’m a musician, on days when I don’t have much else to do, and reflecting that these recordings were made before I was born by a man less than half my age serves as a useful reminder of what the stakes are when laying claim to that term. I’ll let the real experts decide what ’68 means in the context of Wyatt’s long and storied career, but the history of music can have witnessed few minds as free or as beautiful as his was when he made these wonderful noises.